Rewalsar Lake is situated 24 km from Mandi. The blest lake of Rewalsar is revered by Buddhists, Hindus and Sikhs. The lake is shaped like a square with a shoreline of 735 m.
The Rewalsar is Religious places. Rewalsar has three temple which is dedicated to sage Loama, Lord Shiva and Krishna. There are two Tibetan monasteries in front of lake. There is a gurudwara which is built by Raja Joginder Sen. There is a small zoo in Rewalsar. Guru Gobind Singh is also known to have resided in Rewalsar for about a month and the gurudwara was constructed in his honour. 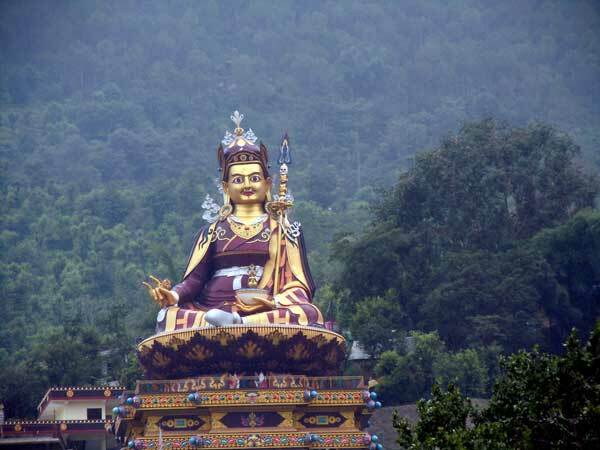 The major attraction of the Rewalsar Lake is the statue of Guru Rinpoche. it is the second largest statue in Himachal Pradesh. It is situated 4000 ft above sea level. There is a statue of Padmasmabhava which is 123 ft inaugurated by Dalai Lama . By Air:The nearest airport from Rewalsar is Bhuntar, which is around 63 km from the town of Mandi. By Train: The nearest railhead is Kiratpur which is 125 away from Mandi. By Bus: Taxis and buses are available from Mandi. The best time to visit Rewalsar Lake is between March and October. The winter are very cold. Heavy woolens clothes are recommended.